Researchers from the US-based Sanford Burnham Prebys Medical Discovery Institute (SBP) have developed a new nanosystem to enhance the visualization of tumors. The proof-of-concept nanosystem has been developed to improve diagnostic imaging for cancer detection. Tumor-imaging nanosystem is said to generate bright tumor signals by delivering quantum dots to cancer cells without any toxic effects. New method will use quantum dots (QDS), which are small particles that emit intense fluorescent signals when exposed to light, as well as an etchant that avoids background signals. The QDs are delivered intravenously, of which some will leave the bloodstream and cross membranes to enter cancer cells. Fluorescent signals emitted from excess QDs will remain in the bloodstream and can be made invisible by injecting the etchant. The etchant, along with the QDs, experience a cation exchange that takes place when zinc in the QDs is swapped for silver in the etchant. Silver-containing QDs lose their fluorescent capabilities, as the etchant will not cross membranes to reach tumor cells. The whole process enables to eliminate background fluorescence and preserve tumor-specific signals. Researchers have developed the method by using mice harboring human breast, prostate and gastric tumors. QDs have been actively delivered to tumors using iRGD, a tumor penetrating peptide that activates a transport pathway that drives the peptide along with bystander molecules. The formation of new company is under the process to further develop the platform for human use. 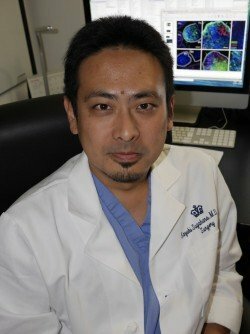 SBP adjunct assistant professor Dr Kazuki Sugahara said: “Tumor imaging is an integral part of cancer detection, treatment and tracking the progress of patients after treatment. Image: SBP adjunct assistant professor Dr Kazuki Sugahara. Photo: courtesy of Kazuki Sugahara.